As more and more voters begin to realize they cannot rely on mainstream media to give them an unbiased view of events as they unfold, the public is looking to smaller papers to give them guidance in the presidential election of 2016. Two daily papers have unexpectedly endorsed Gary Johnson in the past couple of weeks. While Hillary Clinton has five such endorsements to her credit, not a single daily paper has endorsed Donald Trump. With the race for inclusion in the national debate still in progress, local papers are trying to give Johnson a lead in the polls. This is not necessarily because the editors are libertarian. On the contrary, the reason is much simpler. Unbiased journalists see Gary Johnson and Bill Weld as the only sane choice. 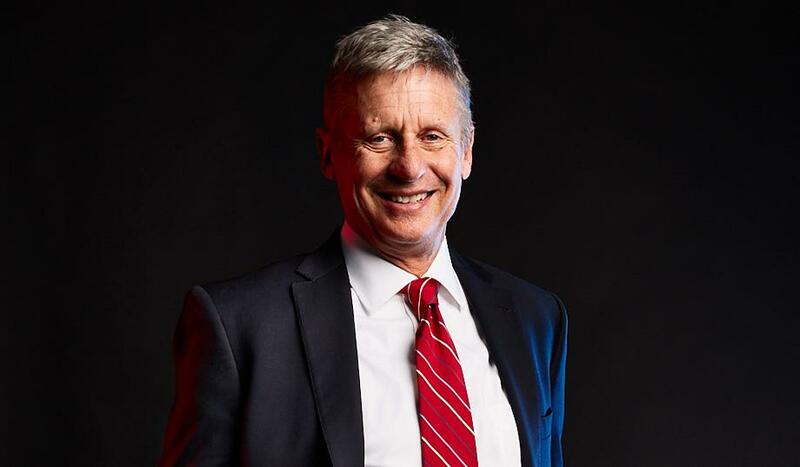 We’ve surprised even ourselves with this endorsement, our first for a Libertarian for president. But the timing has never been better for this particular Libertarian, Gary Johnson of New Mexico. He is everything the presidential candidates for the two major parties are not, thank God. Noting that Johnson and Weld are “principled and honorable,” the editorial board of the Winston-Salem Journal left unspoken the clear implication that Clinton and Trump are not. This endorsement was given on the same day when Hillary Clinton stumbled and fell during a series of medical episodes, and the mainstream media tried to cover for her for as long as they possibly could. It was only after everyone in America had shared the video of the fall that the “big guys” in the media had to admit that everything was not just fine with the Democratic presidential nominee. Even after the Clinton camp came up with pneumonia as the cause of the Clinton collapse, contradicting their own earlier story concerning “overheating and dehydration”, Christiane Amanpour countered with “Can’t a girl have a sick day?” She then went on to say that Clinton’s lack of transparency regarding her health was nothing compared to Trump’s not sharing his tax returns. But for voters tired of both Old Party candidates and their shenanigans, this business-as-usual attitude of covering for one of the two while attacking the other is getting very old. Where can readers turn for an unbiased view of the candidates? Alternative media is often suspect, as many are purveyors of outlandish conspiracy theories no better than the pap the MSM expect readers to swallow. Between the propaganda of mainstream news outlets and the fear-mongering of the yellow journalists of the alternative press, many readers are looking for another way to get their news. Smaller daily papers that are not beholden to any party may just have come into their own, and not only for local readers, but for voters throughout the country who are looking for a fresh angle on the candidates this election year. The Winston-Salem Journal in North Carolina is a Berkshire-Hathaway owned newspaper with a daily circulation of 67,000. 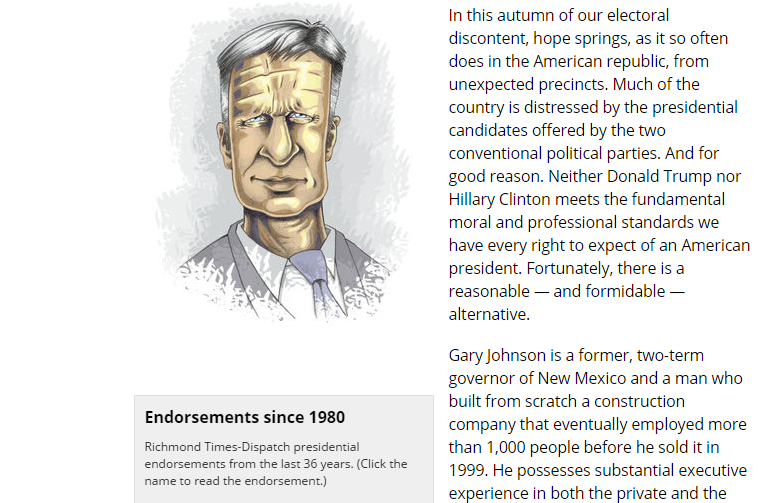 The Richmond Times Dispatch in Virginia, which endorsed Johnson on September 3, 2016, has a daily circulation of 90,000. Before endorsing the Libertarian candidate, the Times Dispatch had had a history of only ever selecting Republicans for political endorsement. But the times they are a changin’, and it is quite possible that the circulation of influential local papers will receive a boost, now that most voters realize the national media giants are all bought and paid for. This could be a death knell not only for the two big parties, but also for the mainstream media.